Heat oven to 350°F. Spray 9-inch glass pie plate or 8-inch square pan with cooking spray. In small bowl, mix syrup, preserves and Worcestershire sauce. Place chicken, skin side up, in pie plate; sprinkle with salt and pepper. Spoon syrup mixture over chicken. Bake uncovered 40 to 45 minutes. Meanwhile, toast waffles until golden brown. Cool slightly, about 2 minutes. Cut waffles into 3/4-inch cubes; set aside. Spray 1-quart casserole with cooking spray (or use 9x5-inch nonstick loaf pan; do not spray). In 10-inch nonstick skillet, melt butter over medium heat. Add onion; cook and stir about 2 minutes or until tender. Stir in waffle pieces and broth, breaking up waffle pieces slightly to moisten. Sprinkle with poultry seasoning and sage. Remove from heat; cool about 5 minutes. Stir in egg white and spinach. Spoon stuffing into casserole. Sprinkle pecans over top. Twenty minutes before chicken is done, place casserole in oven next to chicken in pie plate. Spoon syrup mixture in pie plate over chicken. Bake chicken and stuffing uncovered 20 to 25 minutes longer or until juice of chicken is clear when thickest part is cut to bone (170°F) and stuffing is thoroughly heated. Spoon remaining syrup mixture in pie plate over chicken. 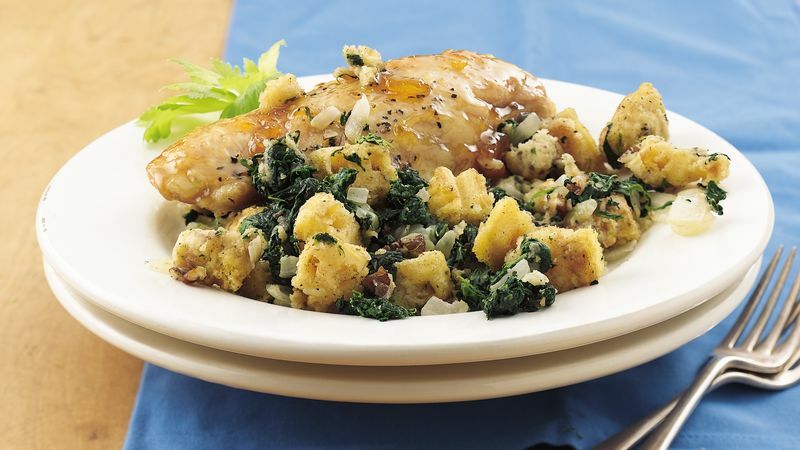 Serve chicken with stuffing.